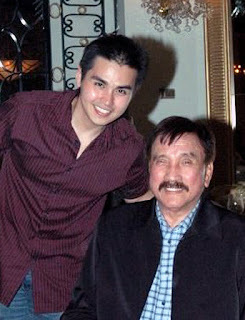 MANILA (Mindanao Examiner / Nov. 1, 2011) – Philippine police implicated a brother of murdered Filipino actor Ram Revilla to the brutal crime after two suspects in the killing were arrested. Revilla, son of an influential politician and movie actor Ramon Revilla, Sr. and his girlfriend Janelle Manahan, were attacked late Friday by two masked gunmen inside the victim’s two-storey house in Parañaque City. Police said it arrested the two men Roy Francis Tolisora and Michael Altia, who were allegedly hired killers, and that authorities are tracking down more suspects to the murder. It said a witness pointed to Revilla’s younger brother, Ramon, 18, as the alleged mastermind to the killing. He was arrested late Monday in Cavite’s Bacoor town, said Senior Superintendent Billy Beltran, Parañaque City police chief. Beltran did not give details of their investigation, but another family member was also charged to the murder. The motive of the killing is still unknown.